Ecstatic, astonished, jubilant .... just some of the reactions at Tallis Wine when we were recently advised we had won a top award with our 2010 Dookie Hills Viognier. Awards Chairman of the 2012 Australian Boutique Wine Show, Huon Hooke presented the trophy to Alice and Richard at a black tie dinner last Friday night at The Four Seasons Hotel in Sydney. Richard said the acknowledgment that our wines were of trophy standard was a great honour. 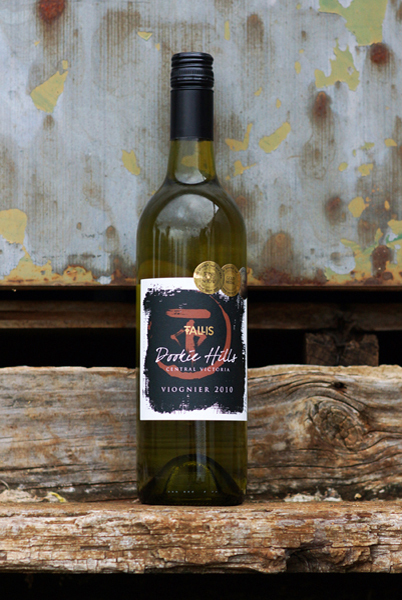 The Dookie Hills Shiraz 2010 was also awarded a silver medal and the Silent Showman Shiraz Viognier awarded a bronze. The 14 trophy winning wines were served with a four course dinner attended by wine media, restaurateurs, wine merchants, export distributors and wine industry guests. The accolade gives Tallis Wine a valuable opportunity for their wines to receive far-reaching exposure and put Dookie on the wine trail map. Open to Australian and New Zealand boutique wineries, CEO Judith Kennedy said the 2012 Wine Show was possibly the most successful year yet with regard to quality. The Show was judged by nine of the most experienced judges in Australia lead by Chairman Huon Hooke judging over three days at Sydney"s Homebush where the record number of trophies was awarded. Our philosophy and commitment around winemaking in the early days when Tallis Wine was established remain unchanged. We want to produce quality over quantity every single time, so if we remain a boutique producer to ensure our wines are varietal and reflective of each vintage then we are happy with that.